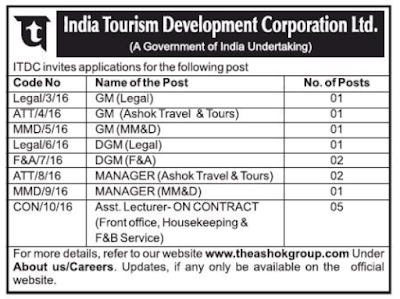 India Tourism Development Corporation Limited i.e ITDC (A Government of India Undertaking) invites applications for Managerial and Assistant Lecturer posts. The last date of submission till 7/10/2016. The India Tourism Development Corporation Limited is a Hospitality, retail and Education company owned by Government of India, under Ministry of Tourism. Details for more, refer to ITDC official website under Careers Section. 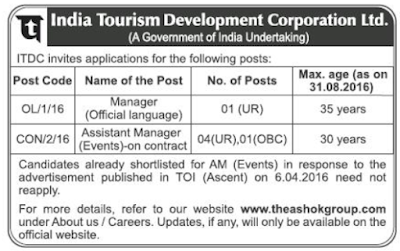 India Tourism Development Corporation Limited i.e ITDC (A Government of India Undertaking) invites applications for the post of Manager (Official Language) on Regular Basis and Assistant Manager (Events) on Contract Basis. • For Manager (OL) : Full time Masters degree in Hindi from recognized University or Institute, with English as a subject at Graduation level. 05 years of post qualification experience out of which at least two years should be in the scale of ₹ 16400‐40500 (IDA) / ₹ 15600‐39100 + 5400 (GP) (CDA) or above in Govt. / Semi Govt. / PSUs / Banks. (OR) 5 years experience as Asstt. Professor / Lecturer of Hindi in a recognized college / University. The Candidate should be conversant in translation work form English to Hindi and vice‐versa and should also have thorough knowledge of Acts and Rules pertaining to implementation of Official Language. • For Assistant Manager (Events) Post : Candidates already shortlisted for Assistant Manager (Events) in response to the advertisement published in TOI (ascent) on 6th April 2016 need not reapply. • Manager (OL) : Application should be submitted through Offline mode only in the prescribed Application Form. Application should be sent in a cover superscribing the code along with the post and discipline applied for with Demand Draft (DD) of ₹ 500/‐ (candidates belonging to SC/ST & PH are exempted from this payment) in favour of India Tourism Development Corporation Ltd., payable at New Delhi. • Assistant Manager (Events) : Detailed notification and last date for apply details are not to be released.